Narrabri's accommodations are few and far between, but fear not! Wotif offers 11 other options, all less than 30 kilometres away. Check out the MAS Country Club Motor Inn and Aaron Inn Motel and see if they suit you. If you find yourself searching for more options in Narrabri, consider the Bellview Motel and the Adelong Motel. They are 11 kilometres and 12 kilometres away from the city's main streets. Wotif also suggests the Crossroads Hotel Narrabri and the Narrabri Big Sky Caravan Park. The first is 12 kilometres away from the center, while the second is 12 kilometres away. You'd have to be crazy to leave Narrabri without seeing the other things in New England. View New England's rural landscapes, rivers, mountains and valleys. You could also head to some of the area's churches, cathedrals and art museums. Energetic visitors can also try mountain climbing. At Wotif, we live, breathe, eat and sleep travel! So when you're ready to hit the road to Narrabri, we'd love nothing more than to get you there. How Much is a Hotel Room in Narrabri? 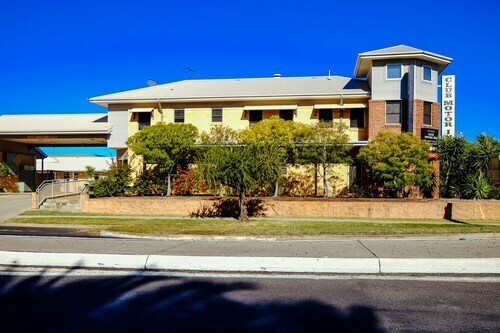 Hotels in Narrabri start at AU$86 per night. Prices and availability subject to change. Additional terms may apply. Very clean and great beds, kitchenette was added advantage. Very close to town centre but still quiet at night. Bbq area where we enjoyed a drink and dinner. Very friendly staff and clean and comfortable rooms.